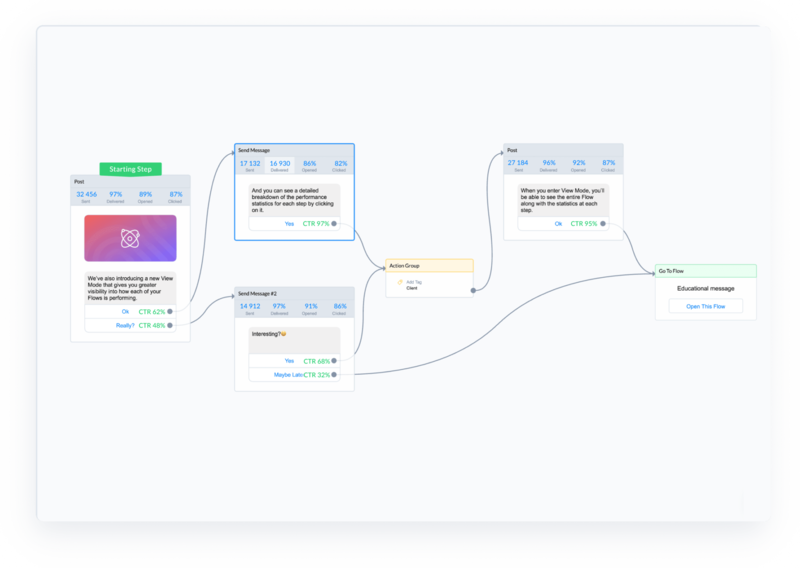 Dig into the new ManyChat Flow Builder that will revolutionize the way you communicate with your customers and Messenger Marketing! We’re VERY excited to announce the biggest and most comprehensive update we’ve ever made to ManyChat: Flow Builder! 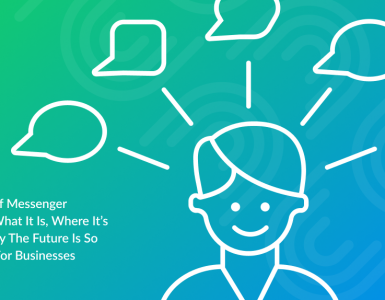 Read on to find out what the Flow Builder is, why it’s different, and why it’s going to revolutionize the way you use ManyChat to communicate with your audience and grow your business. 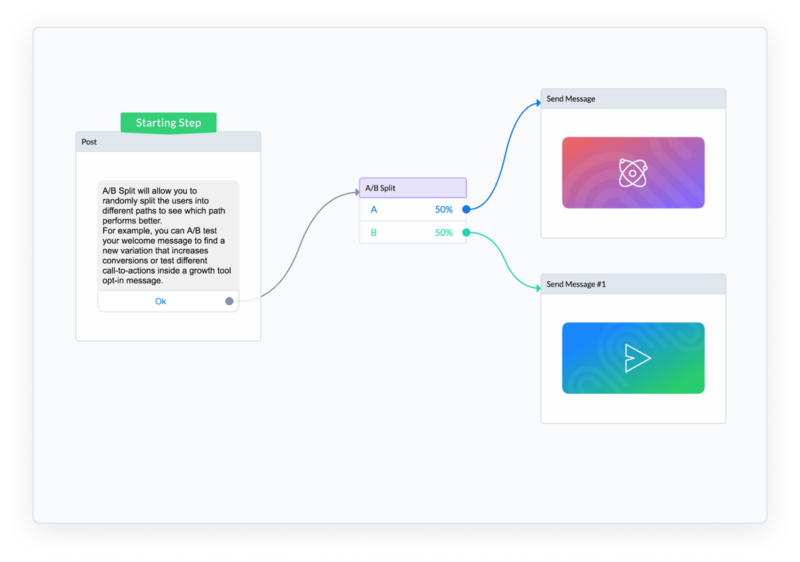 Flow Builder gives you an entirely new way to construct messenger bots inside of ManyChat. The entire process is more visual and intuitive than ever before. Basic Builder worked well for simple sequences, but it came with a big limitation: the builder was linear, but your Flow might not be. If your automated sequence contained forks and loops causing your message logic to branch in different directions, it was very difficult to keep track and visualize… especially if you were trying to explain or show your bot to a coworker or client. Enter the new Flow Builder! This new visual editor makes it faster and easier to see your entire sequence at a glance. The first thing you’ll notice about Flow Builder is how different it looks. You can see at a glance how each message is connected. But the new Flow Builder isn’t just a cosmetic change. We’ve completely reengineered the way you build messenger sequences to give you more power, more choice, and more options to create high-converting messenger sequences. What Can You Do With Flow Builder? With the new Flow Builder you’ll be able to create more complex Flows, faster and easier than before. Let’s take it for a spin so you can see how it works. First, notice that each step in the Flow is represented by a card. There are 3 types of Steps: Content, Action, and Go-To. Content Step includes any sort of message that you can send, such as text, videos, and galleries. Action Step includes any sort of action you want to occur such as tagging users, subscribing them to a Sequence, notifying an admin, opening a conversation, and so on. 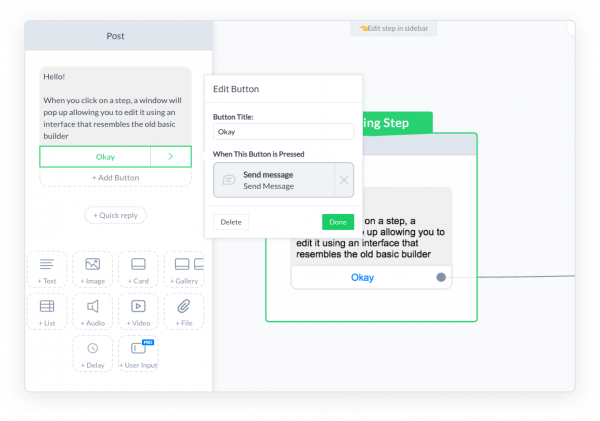 Each Action Step can have multiple actions and can be used as a starting point in your Messages Flow to perform any action before your subscriber gets the first Message. 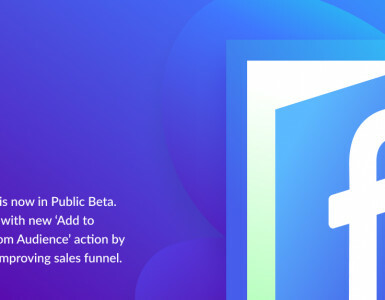 Go-To Step is a brand new type of step that allows you to send your subscribers to a particular Flow from your bot content with just one click without creating a clone. The sequence or order of steps is represented by the lines connecting them together. 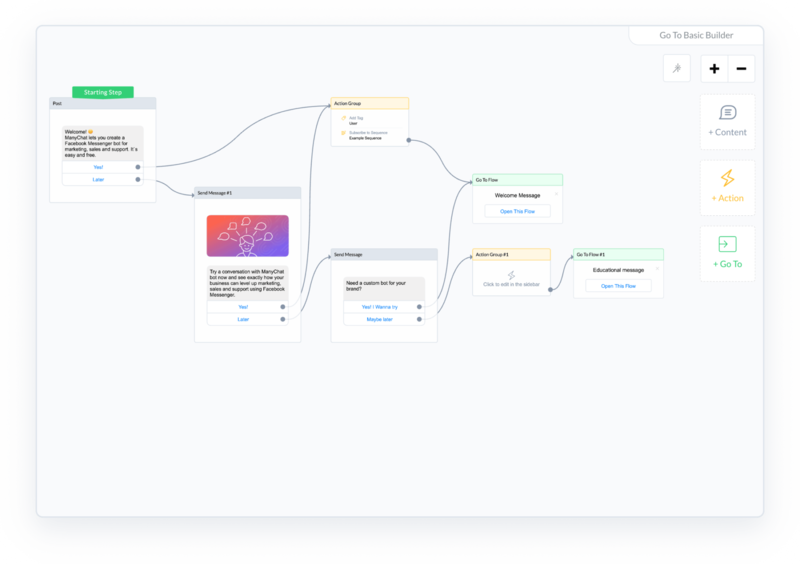 This way you can easily visualize the flow of your chatbot. If you want to change or create a new connection between two steps, all you have to do is drag and drop that line. So if a step has 2 buttons, and each button leads to a different step, now you can easily see how those steps are connected. 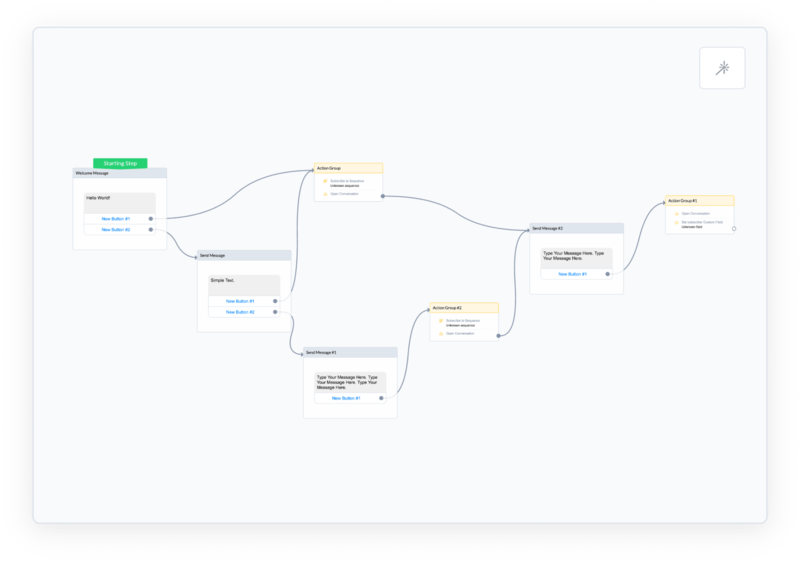 Now that you’ve got an idea of how Flow Builder works, here are a few ways it’s going to help you create better chatbots (while making your life easier in the process). One of the best parts of the new Flow Builder is just how much faster and easier it is to use. Now you can add or remove steps from your Flow with just a few clicks. Just select the type of Step you want to create (Content, Action, Go-To), add that Step’s content, and drag to connect it to another Step. 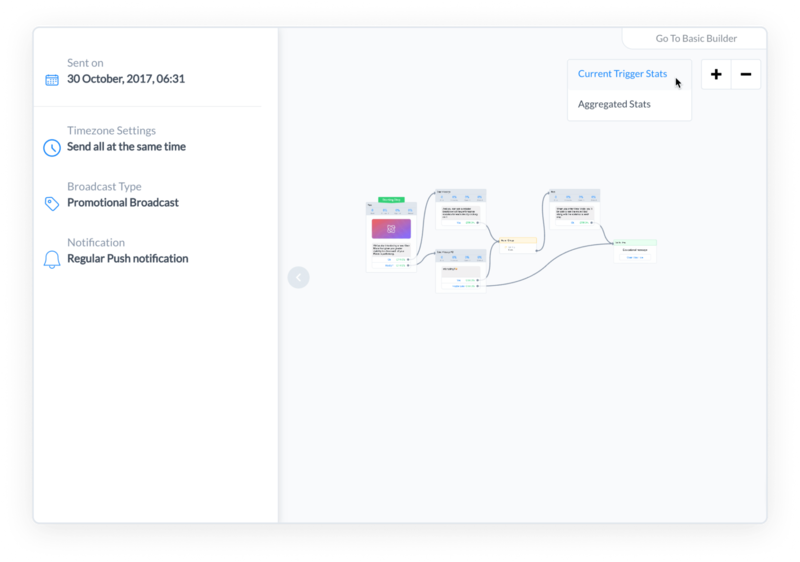 We’ve also added some convenient new features that make it easier to build out your flows. For example, now you can delete multiple messages at once, or copy and paste steps—making it easy to duplicate content from one flow to another. This allows you to easily send subscribers from one Flow to another, without requiring them to click a button. There are many ways you can use this new feature, but one of the most convenient is the ability to easily reuse Flows (this is huge)!! For example, imagine you have a 7-part messenger sequence that educates your visitors on a topic relevant to your business. Let’s say it’s a series called, “7 Tips to Selling Your House for the Highest Possible Price,” and this sequence contains helpful content, videos, and links to relevant articles on your website. Maybe you’re using this 7-part education sequence as part of a Keyword Flow, but in the future you might want to include it as part of your welcome message, in your main menu, or simply use it in another Flow. Now you could copy & paste this entire sequence every time you wanted to reuse it…but that would be a time-consuming process. And if you ever updated that sequence, you’d have to update it in multiple places. Instead, it’s much easier to use the new “Go-To” feature. Instead of putting your 7-part educational series into one specific messenger sequence, you can make it an entirely separate Flow. 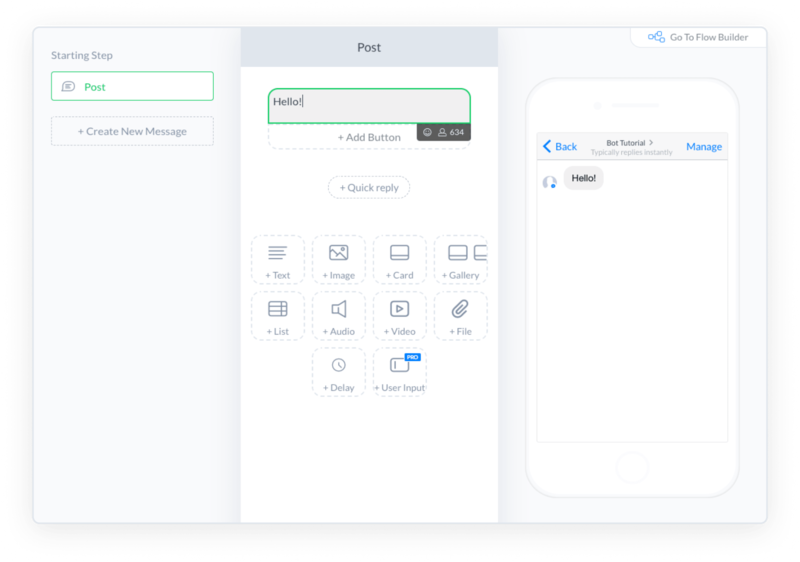 And then using the “Go-To” feature, you can easily send users to that flow from anywhere you want (including different keyword sequences, welcome messages, and so on). We’ve also included a View Mode that gives you greater visibility into how each of your Flows is performing. When you enter View Mode, you’ll be able to see the entire Flow along with the statistics at each step. When viewing statistics in View Mode, you have two options. “Aggregated stats” will show you the statistics from all sources, giving you a big-picture view of that Flow’s performance as a whole. And “Current Trigger Stats” will show you the statistics for users who entered this Flow from a specific entry point. This is similar to being able to compare your website performance from different referral sources. …Now you’ll be able to gain better insight into which Flows are working, and which ones aren’t, for each specific group of users. Armed with this information, you’ll be able to optimize your chatbots based on what your users find most engaging. We couldn’t be more excited about the all-new Flow Builder, but we’re not stopping there. Here’s a glimpse of a few more tools that are in the works. Keep your eyes peeled for these new features in your pro account soon! Right now, there’s no particularly easy way to share your ManyChat Flows with the rest of your team. But that’s changing! Because we’re working on a tool that will allow you to easily export your Flow as an image. Just choose the size and file type you want, and your entire Flow will be exported in an easy-to-view image. This is going to be really helpful for teams and agencies in which multiple people are working on the same chatbots. We’re also releasing the ability to copy-and-paste you bot! This will make it easier to create “templates” for certain verticals or industries. Marketers are going to love this one! As a result, you’ll be able to optimize and improve the performance of your chatbots over time. 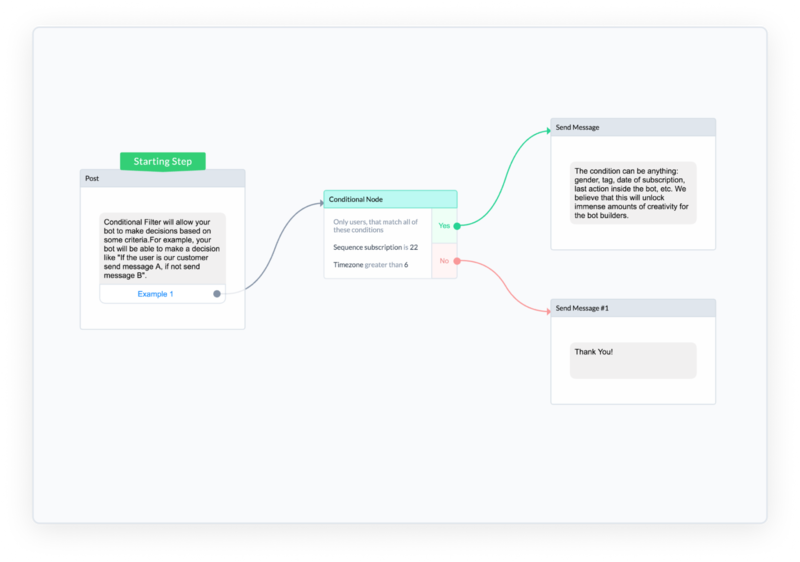 Finally, we’re working on adding “Conditional Steps” that will allow you to filter the messages in your Flow so you can customize your messages based on conditions that you choose. 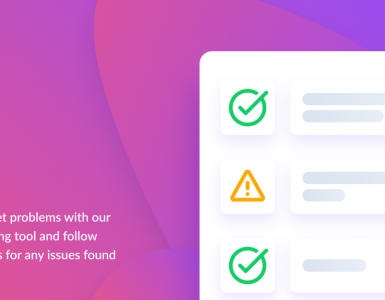 This new feature will allow for all kinds of interesting Flow that aren’t possible right now, such as quizzes, personality tests, and other chatbots that require more complex logic with answers that change depending on the user. If you’re already a ManyChat user, we encourage you to log into your account now and take the new Flow Builder out for a spin. 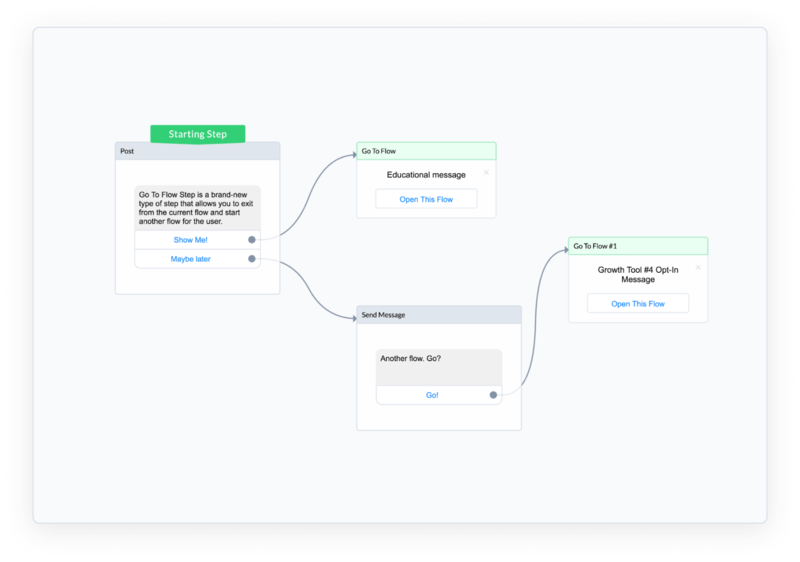 We just know you’re going to love how much easier and more intuitive it is to build out new chatbot Flows. If you’re not yet using ManyChat, this is the perfect time to get started! Facebook Messenger is set to become the next BIG marketing channel, and the companies who come out ahead are going to the the early adopters. Remember ManyChat has a free account option, so you have nothing to lose—and a lot of new business to gain. Hey guys! This is great idea!!! Before that update, I allways made conversations on RealTimeBoard, and it takes time to get all flow on chat board. Can`t wait to try new way You build! Thanx!!! Already using it! I’ll be using ManyChat more often now because it’s easier to set up, visulaize, and view stats. BAM! OMG! You guys rock! I just purchased Manychat a couple weeks ago and I have been drawing out all my branches on paper because I needed it to track my many branches of conversations. I can’t wait to try this out and let other author’s know how easy doing chatbots can be. Thank you! Wow, great stuff, this is what I was waiting for! Fantastic developments ManyChat! Fair play to yous. Looking forward to visualising the conversation flows. That’s a big game changer! Great job guys!